In small bowl, mix Dijon mustard and mayonnaise. Place 4 bread slices on work surface, and spread top side of each piece with mustard mixture, reserving 1 tablespoon of mixture. Top with 2 slices each of ham, turkey, bologna and pepperoni. Top 2 of the 4 stacks of meat with 2 slices each of American cheese and other 2 with 2 slices each of Swiss cheese. Top American cheese with pickle planks, and top Swiss cheese with tomato slices. Top pickle planks with 2 leaves of lettuce, and top tomatoes with remaining 2 leaves of lettuce. Spread remaining mustard mixture on 2 remaining bread slices, and place 1 each on top of the bread with meat, Swiss cheese, tomato and lettuce. 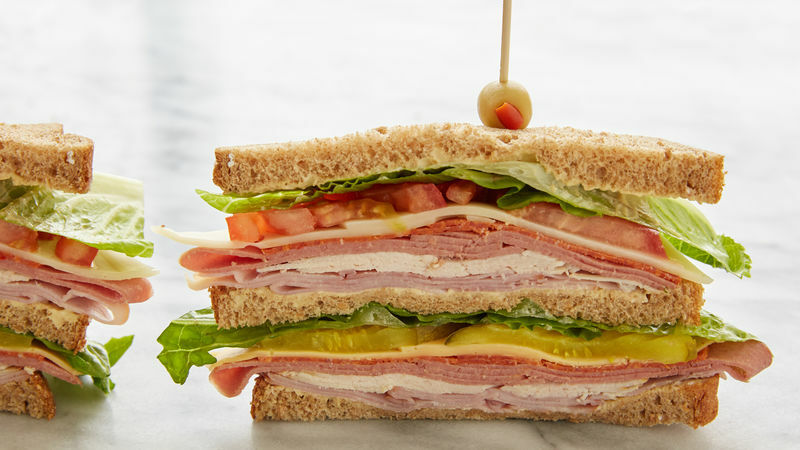 Carefully place each of these assembled sandwiches on top of the bread with meat, American cheese, pickle planks and lettuce, forming 2 layered sandwiches. Insert 2 toothpicks or bamboo skewers in each sandwich, and carefully cut each in half diagonally. To make this sandwich ahead, wrap it tightly with plastic wrap before cutting, and refrigerate up to 1 hour. Layering the sandwich as described above prevents the “wet ingredients” like tomato and pickle from coming in contact with the bread and helps the sandwich stay together.